In a study published in the Jan. 16, 2018, advance online issue of the Journal of Biomechanics recipients of Quantum Awards from the National Institute of Biomedical Imaging and Bioengineering (NIBIB) have been able to combine rare expertise in artificial kidney development with computer simulation of blood flow.The hitch in development of an artificial Kidney has been to keep the blood flowing smoothly through the artificial device without clotting. In such devices, as blood platelets respond to mechanical forces, they have a natural tendency to clot, causing a device malfunction.The scientists seem to have been able to overcome this problem. Kidneys extract toxins from the blood and maintain fluid balance in the body by urine excretion. They also make hormones to regulate blood pressure, promote red-cell production, and support bone health. Kidney disease can cause kidneys to fail and toxins to build up in the blood. 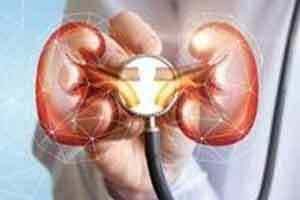 Kidney failure affects more than 660,000 people per year in the United States and contributes to 89,000 deaths. Some people with kidney failure are fortunate enough to receive a transplanted donor kidney. Of the 100,000 people each year on the transplant waiting list, just 18,000 receive a donor kidney. A stop-gap measure for patients under these life-threatening conditions is dialysis, a way to process the blood through an external filtration system. The implantable artificial kidney—a bioengineered device that combines a high-efficiency silicon filter and a bioreactor of kidney tubule cells—has been a long-term project for study co-authors Shuvo Roy, Ph.D., University of California, San Francisco (UCSF) professor of bioengineering and therapeutic sciences, and William H. Fissell, IV, M.D., University of Vanderbilt associate professor of medicine. The experimental device is designed to accommodate up to a liter of blood per minute, filtering it through an array of silicon membranes. The filtered fluid contains toxins, water, electrolytes, and sugars. The fluid then undergoes a second stage of processing in a bioreactor of lab-grown cells of the type normally lining the tubules of the kidney. These cells reabsorb most of the sugars, salts, and water back into the bloodstream. The remainder becomes urine that is directed to the bladder and out of the body. Much of the technology to implement this complex process exists, some of it developed by Roy and Fissell under previous funding from the NIBIB Quantum Award program. One of the remaining challenges is for researchers to integrate the various innovations into one functional, compact—and thus implantable—device. In the newly published work, the UCSF-Vanderbilt team collaborated with co-author Danny Bluestein, Ph.D., professor of biomedical engineering at the State University of New York, Stony Brook, who also is a Quantum Award grantee. In 2010, NIBIB awarded Bluestein’s laboratory a grant to study thromboresistance—the prevention of clotting in circulating blood. Bluestein’s group used the technique to study cardiovascular implant devices, such as artificial heart valves, as well as the device used in surgery when temporarily bypassing heart circulation. Roy and Fissell first heard about Bluestein’s methodology, called device thrombogenicity emulation (DTE), at a 2014 meeting at NIBIB for Quantum Award grantees. The Bluestein DTE methodology quantifies flow patterns and stressors that develop during the blood flow. During Bluestein’s description of DTE, Roy and Fissell immediately saw the potential for applying his theories to their artificial kidney design. Appropriate computer simulation could shave years or even decades off the design process for the artificial kidney and produce a device with a well analyzed and tested safety profile for platelet activation and subsequent clot formation. “Platelets become activated, and initiate blood clotting in response to the severity of stress forces, as well as to the amount of time the platelets are circulating through the device,” Bluestein said. Bluestein’s simulation methodology—first developed to numerically predict the accumulation of stress on platelets within devices that support circulation in heart failure patients—was readily adaptable to the fluid dynamics aspects of the artificial kidney. Simulation results tipped in favor of the parallel flow system, particularly with respect to the condition of blood platelets after repeated circulation within the filtration systems. However, both designs met the researchers’ predetermined criteria for the uniform flow of blood through the devices and accumulation of shear stress forces on the platelets against the walls of the device flow channels. Therefore, the researchers plan to test both implant designs in prospective experiments in pigs. Additional designs could be tested in the future.